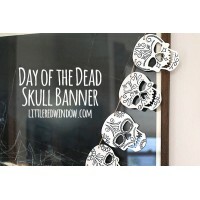 Turn a regular Halloween decoration into a fun Day of the Dead Skull Banner! I am so excited to share this project with you! I have been seeing the marbling trend all over Pinterest lately and finally succumbed to e-peer pressure and tried it out for myself over the weekend. 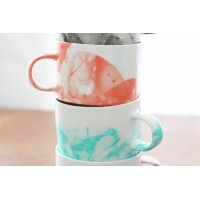 I was so inspired by this gorgeous post where they marbled mugs and decided I had to start there. The best thing about this project is it only costs a couple of dollars to make and even less time to finish. I found my mugs for $.79 each at Goodwill and used nail polish I already had at home which means I was able to make 6 mugs for less than $5! It’s a steal with a BIG payoff. Plus, I’m obsessed with the outcome. If you are looking for a last minute kids Christmas craft, look no further! 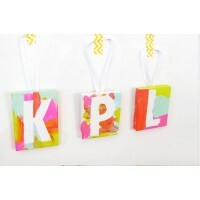 These mini canvas ornaments are easy to make and make great keepsakes or gifts for grandparents. The best part is that kids of all ages can make one! Both my 2 year old and 7 year old had a blast making these and they turned out equally as adorable. I got this idea because awhile ago, my girls made giant versions of these painted letter canvases. It’s one of the most popular projects on my blog to date. Everything is cuter in miniature form, so I decided to try using the same method to make some canvas kids Christmas ornaments! I am so excited to share this project with you all today–I just love how it turned out and it’s so simple to make! 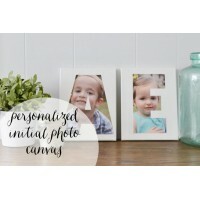 The gifting possibilities, too, are endless…this would be perfect for a baby gift, a family holiday gift, or even a wedding present (just use the couple’s last initial)! So, without further ado, let’s get started! 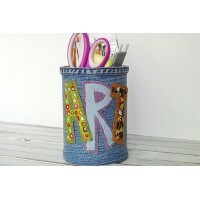 This denim covered can is perfect for holding markers, pens, pencils, scissors or paintbrushes. Use scrap fabric and recycled blue jeans to make this fun pencil holder for your office, craft room, school art room or even a homework desk. A fun recycling project for any age! I love getting organized. I didn’t know it until I was an adult, because I did not feel this way when I was younger. In addition to organization, I’ve also started eating dinner earlier and grown an appreciation for drugstores – it just all seems to work! 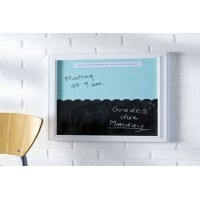 One of my latest projects along these lines is this dual DIY dry erase board and chalkboard. It’s perfect to your home decor. But – it also makes a great gift.